Hyundai Motor has revealed further details of the new IONIQ ahead of its launch in Korea later this month. The innovative alternative-fuel compact vehicle, now available for pre-order in selected markets, is the first-ever car to offer a choice of three efficient and ultra-low emission powertrain options in one body type. 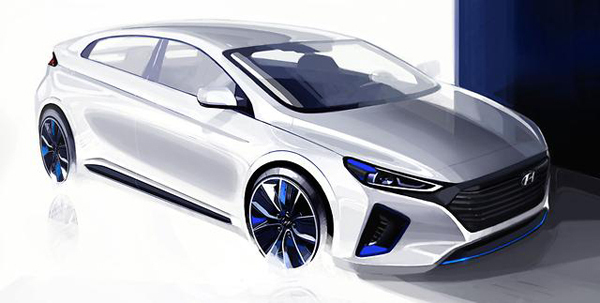 The latest interior and exterior renderings reveal more of the IONIQ’s eco-friendly credentials, with its advanced powertrain technology central to Hyundai Motor’s aim for the world’s best hybrid fuel-efficiency. The newly-developed platform, available with full electric, plug-in gasoline / electric hybrid, or gasoline / electric hybrid powertrains, also delivers a fun and responsive driving experience to match the emotional appeal of the car’s eye-catching lines. The exterior of the IONIQ features a distinguished, cutting-edge aerodynamic design. Simple yet carefully wrought contours enhance the IONIQ’s coupe-like silhouette and minimize wind resistance by assisting the efficient management of airflow. At the front of the car, familiar Hyundai design themes are evident – notably the signature hexagonal grille – as striking blue and white colors blend with the headlights to visually depict the purity of the IONIQ as an eco-friendly car. The smooth, elegant and uncluttered design theme continues inside the IONIQ as its futuristic perspective draws on the car’s hybrid credentials. The efficient use of interior space provides a sleek and light feel, which continues through the logical layout of control functions. Simple and stylish surfaces make use of eco-friendly materials to convey a futuristic yet warm cabin ambience that will meet the needs of those wishing to reduce the impact their motoring has on the environment while enjoying outstanding fuel efficiency, performance and handling. The IONIQ is due to be shown at the Geneva International Motor Show and the New York Auto Show in March 2016 after its world premiere in Korea later this month.